In our previous articles, we were talking about how to check free space on Mac and 5 steps to free up hard drive. On this page, we are going to review in more detail one of the disk space eaters – duplicate files and folders. How to find duplicates manually? 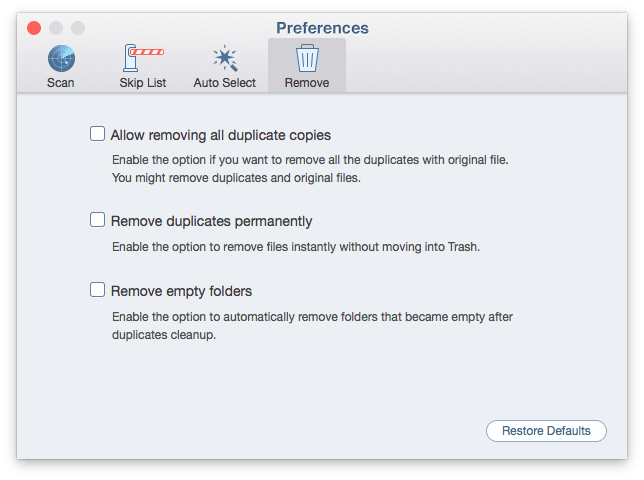 How to quickly find duplicates on Mac with Duplicate File Finder? What is duplicates searching algorithm? 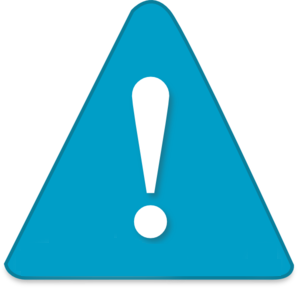 Three common scenarios for duplicate removal via Duplicate File Finder. The fastest way to select duplicates from a specific folder. How to find duplicate images in Mac Photo? Why some duplicates can not be removed? If you are trying to find duplicates on Mac manually, you may realize that it’s not that simple. You can sort files in the Finder by types (name, extension, size, etc.) and review all the files one after another. For that you would need to create a Smart Folder. Open Finder and use Command+Option+N shortcut. In a right top bottom click Plus button. Here you can choose the kind of files and folders you want. If you don’t see the criteria you need, click “Other…” and select the attribute for a search. Now open each file that has the same name or size and check for duplicates. Well, as you see, it’s better not to lose time and use the duplicate cleaner. Let’s see how to remove duplicate files easily and quickly. We can’t imagine how many identical images, videos and other types of files are on our computers. And if there is more than one Mac user, then you can be sure the same music, photos or documents are kept on disk. Double files may take up significant space in your hard drive. But don’t worry. 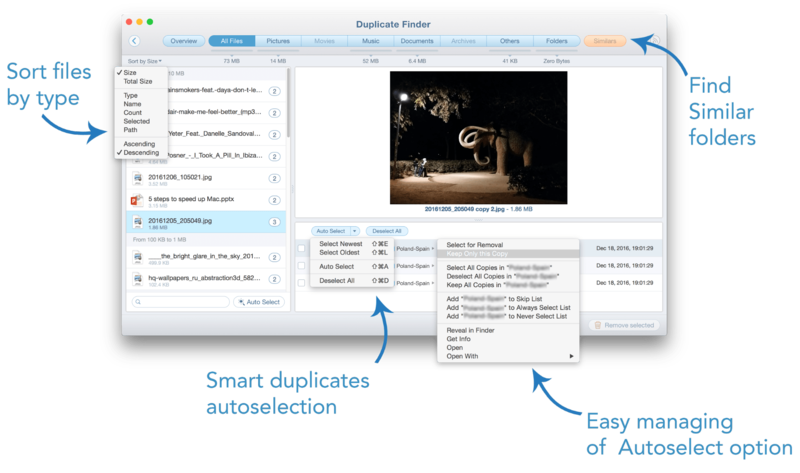 Here is the best software to remove duplicate files – Duplicate File Finder. 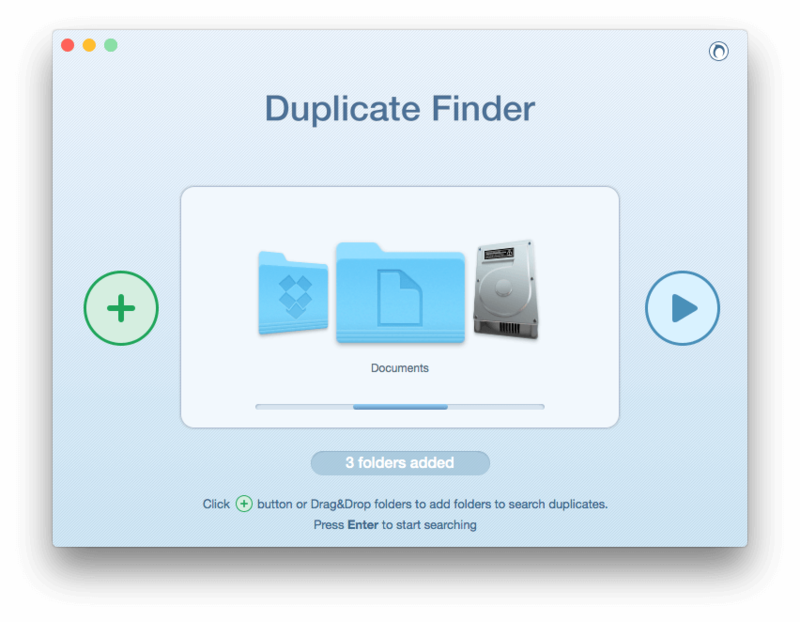 Duplicate File Finder is an app to delete duplicate files on Mac and is Free to Download. You can compare two or more folders/hard drives to duplicate files and delete the same files. Before checking files for identity by their data, the algorithm for finding duplicate files uses two main characteristics – sizes and extensions of the files. This means that If two or more files with the same extensions have the same size, they are then compared by their data. The filename is not taken into account. Users often rename files, so identifying duplicates by name is not reliable. Furthermore, different files might often have the same name. For example, If there are two identical files with img.png and myphoto.PN, they will be displayed as duplicates. However, if two files differ from each other in size – even by one byte – they will not be displayed in the application. 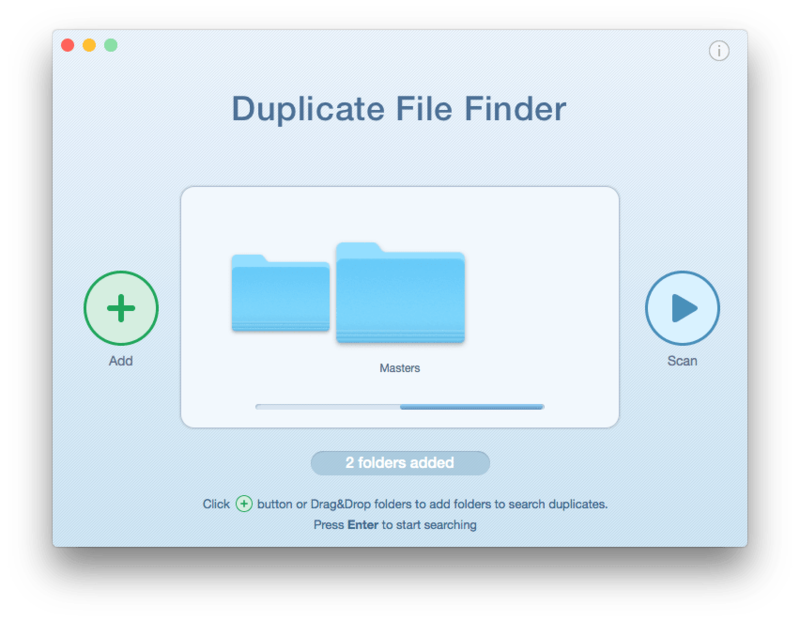 With the app you can find duplicate files in several different folders or even hard disks per single session. You should just click the “Plus” button or select and drag and drop several folders you want to scan for duplicates. It is possible to scan even the whole disk. 1. Find duplicates for a particular file. 2. Find and remove biggest duplicates to free up disk space. Take a look at Cleanup Hints (list of quick tips to select and remove the biggest duplicate files). Even if you are working with this duplicate file software for the first time, you will find it extremely helpful. Or switch to All Files and sort duplicates by Total Size → select and remove the biggest duplicate files. Or switch to Folders panel and remove duplicate folders. Note that similar folders are bigger than files. 3. Find duplicate files and remove them one by one. Scan the folder(s) → switch to any category and preview your duplicate files → select duplicates one by one, previewing them → click the Remove button. This is the longest way. However, you may prefer to preview each file and decide which ones to delete. If you are working with this duplicate file software for the first time, you may find Cleanup Hints extremely helpful. Go to the app preferences → switch to the Auto Select pane → add to the Always Select list a folder from which you want to remove duplicates → add to the Never Select list a folder in which you want to keep duplicates as originals → scan the folders → click the Autoselect button (all duplicates specified in Always Select will be selected) → review them and click Remove. The Autoselect feature is a reliable way to speed up the selection of tons of duplicates. 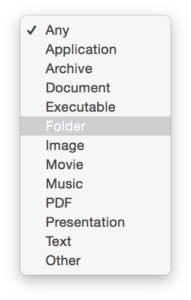 You can also use a command “Select All Copies in …” from the context menu and specify a particular folder for duplicate removal. 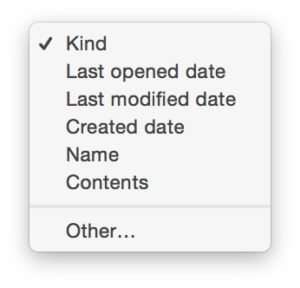 Or use a reverse command “Keep All Copies in …” that will select files in all folders except the specified one. In the app’s Preferences you can find some more helpful setting possibilities. 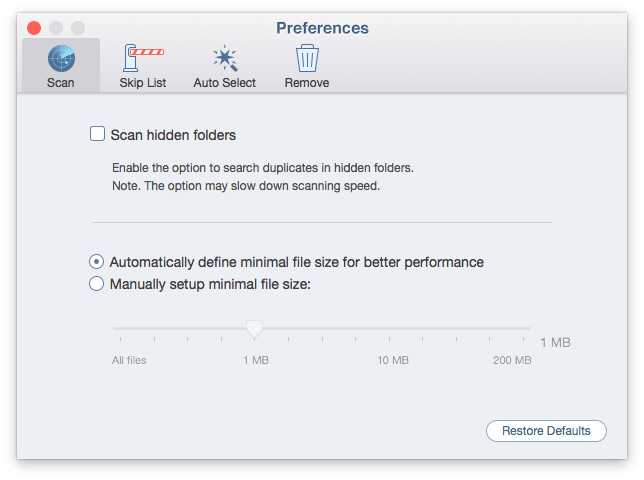 For example, by default the application skips the smallest files to make scanning fast. If you want scan all the files, including the smallest ones, change the app option Manually setup minimal file size to All Files. Also, by default, the app does not check files in hidden folders, however, you can do it by changing settings in the Preferences. And even setting up the files’ extensions that should not be scanned is possible. 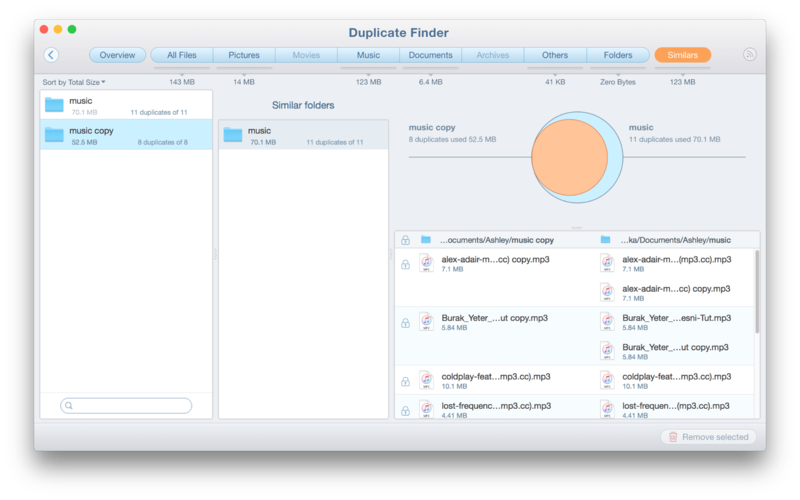 Duplicate File Finder is an app to find duplicate files on regular disks and folders. Actually, it’s not intended to search for identical images inside the Mac Photos application because all pictures there are kept inside special packages. Nevertheless, you can scan the photos if you unfold the package and select images from its subfolders. Find the Photo Library in the Finder window. Make a right-mouse click and select the Show Package Contents command from the context menu. 3. Select the Masters folder or any of its subfolders. Drag & drop the selected folder into the Duplicate File Finder start panel, and scan it. Some duplicate files might exist in some external folders, so it is recommended to scan several folders. Note, you should not remove duplicate photos from Photo Library. This program has a special structure and internal links for all stored pictures, so removal of files inside it may damage its structure. Delete duplicates from other identical folders. What if the duplicates cannot be removed? You are trying to remove files from an external drive which is mounted as read-only. For example, you mount NTFS external disk and don’t have a special driver to make the disk writable on Mac. You should therefore install the necessary extension to allow removal of the duplicates. You are trying to remove files from external volume that does not have the Trash folder as yet. By default, Duplicate File Finder moves files to the Trash. If no Trash folder has been created, the app does not have enough permission to remove a file.You should switch to Finder window and from there remove any unneeded file on that external drive/volume. The Trash for external volume will then be created, after which Duplicate File Finder can remove identical files. Your files might be locked. Check file permissions – select a file/ folder in the Finder, use CMD+I shortcut to verify the permissions. Your files might be used by another application. 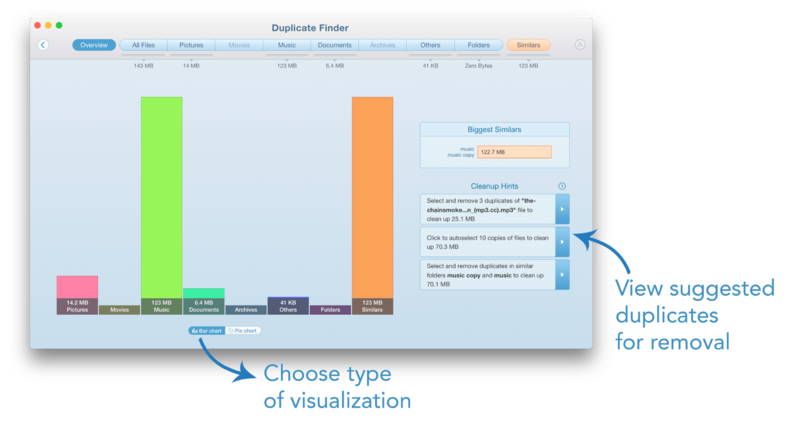 In conclusion, it should be said that if you have the time and interest, you can use the first method – find and remove duplicates with Finder. However, if you are looking for an easy program to find duplicate files, then use the duplicate cleaner mentioned above. 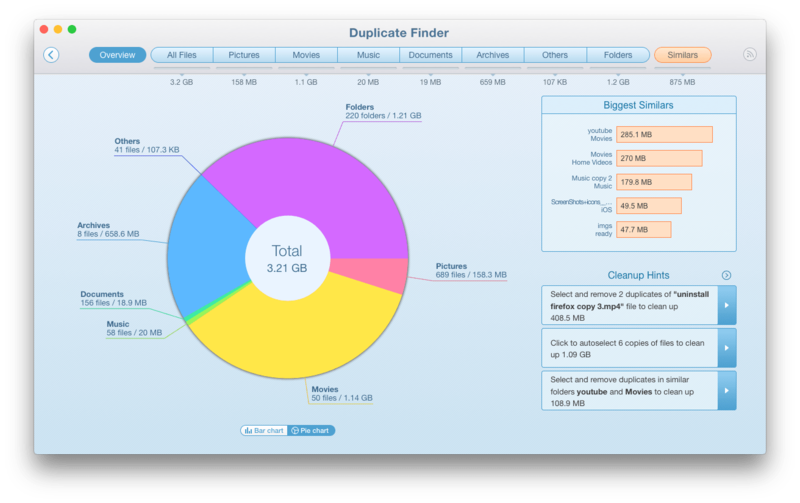 You can use its free version to finds all duplicate files on your Mac. 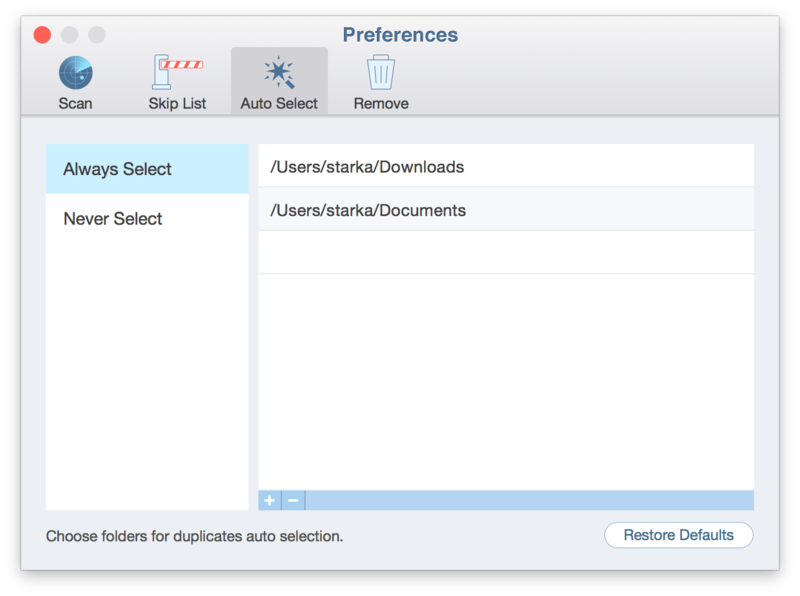 If you want more features (find duplicate folders and similars), you can use in-app purchase Upgrade to Pro.